Place 1 cup of yogurt, basil, parsley, chives, lemon juice, honey and pepper in a blender or food processor. Cover and pulse until smooth (dressing will be green in color). Pour yogurt mixture into a medium bowl; stir in remaining yogurt, mayonnaise and salt and additional pepper, if desired until just blended; refrigerate until ready to serve. Place lettuce at the bottom of a bowl and sprinkle the tomatoes, onion, cucumber, chicken, chopped bacon, egg and shredded cheese on top. Just before serving, pour dressing over salad and toss lightly. 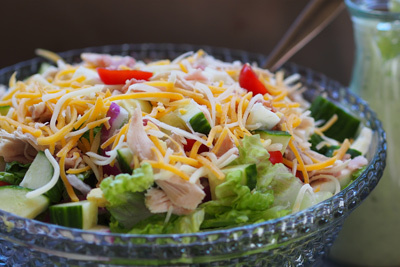 *Dressing: For a more traditional Cobb Salad, substitute bottled Blue Cheese dressing in place of the dressing recipe here.